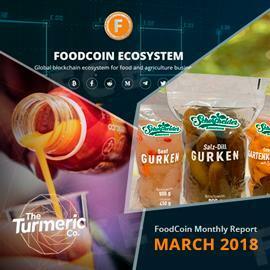 We want our community to be informed of the work we do, and we are starting our reporting system highlighting the development accomplishments and important events of FoodCoin Ecosystem on the way through the roadmap. At the beginning of each month, we will be publishing reports regarding the events from the last month. The Turmeric Company. This UK-based company founded by Premier League footballer Thomas Hal Robson-Kanu. The main purpose of this partnership is to inplement FoodCoin blockcjain technology into its supply management system and accept FoodCoins as payment for its products. German company Aldim GmbH, a producer of canned food, will also adopt FoodCoin Ecosystem blockchain to optimize its supply chain. As a partner of FoodCoin Aldim’s Founder and CEO Mr.
Alexander Schneckenhaus seeks to bring the quality of the products to the most modern level, and sees blockchain as a great opportunity seek trusted suppliers and get rid from paperwork. FoodCoin website was redesigned. The interface and the content became simpler, while remaining convenient like before. More detailed version of the Roadmap with plans of the team, also became available. FoodScan Beta Version was released. This is a tracking system created especially for FOOD tokens to monitor current transactions and holders. Scanner Dashboard provides general information about the token, number of blocks and FoodCoin holders. It also allows to track the transaction of any particular account. Started the development of WallOK prototype. WallOK is a multifunctional advanced cryptowallet created specifically to operate with FoodCoin Ecosystem. -Mailing system improved. The newsletters now will be sent on a regular basis. Let us introduce you our Development Team! Sergey Boykov, software developer that has worked both for large companies and startups. He is the Lead Developer of WallOK and FoodScan. Dmitriy Tsvetkov, DevOps Engineer who designed of infrastructure from ground zero to ready systems with CI/DI automation. Said Syakin, Solution Architect and Chief Technology Officer. Lead Developer of FoodCoin Blockchain implementation. Thank you for being with us, you are all amazing! Our plans are going to update, and new events will also be announced. Stay tuned for the news and the next monthly report which comes out in April.